In 1944, Norman Thomas predicted that today's Democratic Party would eventually support Socialism.Thomas was a six-time Presidential candidate representing the Socialist Party. "The American people will never knowingly adopt Socialism. 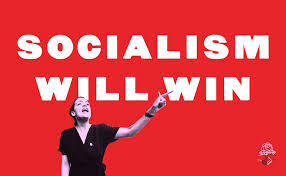 But under the name of Liberalism, they will adopt every fragment of the Socialist Program, until one day, America will be a Socialist nation, without knowing how it happened. I no longer need to run for the Socialist Party of America, the Democrat Party has adopted our platform." Norman Thomas was the modern day predecessor to Saul David Alinsky who ultimately became a committed Communist. Alinsky eventually wrote two books "Rules For Radicals" and "Reveille For Radicals"" These books became the guiding light for today's Democratic Party. In fact, one cannot fully comprehend the Democratic philosophy without considering Rules for Radicals. The Alinsky book produced such Democratic Party radicals as Bill Ayers and Barrack Hussein Obama, and Hillary Rodham Clinton. Hillary's college thesis was based upon Alinsky's work. Perhaps we should have paid closer attention. "True revolutionaries do not flaunt their radicalism" and "They cut their hair, put on suits and infiltrate the system from within". Alinsky taught Democratic Party radicals to penetrate existing institutions such as churches, unions, and political parties. These communists slowly, but surely gained more power. The power enabled Alinsky's philsophy "slow, patient process", to take over control of the Democrat Party. Alinsky's list of 13 "Rules for Radicals," offered with his advice that political activism cannot be a self-serving enterprise: "People cannot be free unless they are willing to sacrifice some of their interests to guarantee the freedom of others. The price of democracy is the ongoing pursuit of the common good by all of the people." The following is a summary of the philosophy that has wrecked our Republic. 1. "Power is not only what you have, but what the enemy thinks you have." Power is derived from 2 main sources – money and people. "Have-Nots" must build power from flesh and blood and this is who socialism appeals to. 2. "Never go outside the expertise of your people." It results in confusion, fear and retreat. Feeling secure adds to the backbone of anyone. 3. "Whenever possible, go outside the expertise of the enemy." Look for ways to increase insecurity, anxiety and uncertainty. This is why the Democrats are determined to admit MS-13 and ISIS to our country. 4. "Make the enemy live up to its own book of rules." If the rule is that every letter gets a reply, send 30,000 letters. You can kill them with this because no one can possibly obey all of their own rules. 5. "Ridicule is man's most potent weapon." There is no defense. It's irrational. It's infuriating. It also works as a key pressure point to force the enemy into concessions. This explains the CNN mantra against Trump that the rest of the MSM has emulated. 6. "A good tactic is one your people enjoy." They'll keep doing it without urging and come back to do more. They're doing their thing, and will even suggest better ones. This explains the enduring radicalism of Antifa and Black Lives Matter. 7. "A tactic that drags on too long becomes a drag." Don't become old news. 8. "Keep the pressure on. Never let up." Keep trying new things to keep the opposition off balance. As the opposition masters one approach, hit them from the flank with something new. This is why the foundations of our Christian culture are under attack. There are hundreds of genders, whites are evil and Christians must be put to death. 9. "The threat is usually more terrifying than the thing itself." Imagination and ego can dream up many more consequences than any activist. 11. "If you push a negative hard enough, it will push through and become a positive." Violence from the other side can win the public to your side because the public sympathizes with the underdog. 12. "The price of a successful attack is a constructive alternative." Never let the enemy score points because you're caught without a solution to the problem. This is why Trump can never be allowed to build the wall. 13. "Pick the target, freeze it, personalize it, and polarize it." Cut off the support network and isolate the target from sympathy. Go after people and not institutions; people hurt faster than institutions.